Like dust floating aimlessly from one surface to the next, as it is easily affected by changing wind patterns or eager dust rags, there is sometimes no meaningful direction in sight. Ambitions are only glorious words, and opportunities are closed gates. 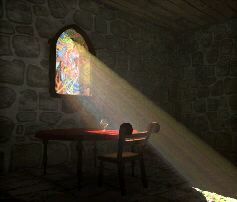 But sometimes, as we sit in our reflective corners, we subconsciously turn our faces to the room's generous window. Our gaze lingers without a focus as we toss around those perturbing thoughts, and then our consciousness taps into a sea of shimmering molecules. The sun's wisdom caresses the directionless dust, and in their tranquil and harmonious interaction we find a suitable door through which we may lead our thoughts. It is through such a door that I hope to carry (and not drag) some of my thoughts. The human condition is a disappointing one. People will let us down, even if we think that our expectations of them are elementary. It seems too much to expect sincerity in most. It's becoming second nature to consider most promises as good as empty. But that's okay. As frustrating as it may be, in the grand scheme of things it is ineffectual and thus it must not be given more attention than it is worth. We must live with our principles that carry us, our certainty of faith that guides us, and our dependence on God that supports us. And while we continue to stumble over the same rocks and new pebbles, we must pick ourselves up, even though we may stand alone, and carry on with the preparations that must be achieved for the life of eternity that awaits us. From irritable indifference, there needed to be a way out. And while the path out and beyond the sheltered cave isn't clearly marked, there is a gentle glimmer. Yes, the words on this blog are usually my own, if not inspired by the wisdom of beautiful teachers and friends.